Capt C. Bertani found these on the London Gazette, and I wanted to pass them along. 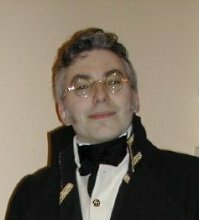 Blue Coat, with Blue Lappels and round Cuffs; the Lappels to have One Row of Gold Lace, and the Cuffs and Pockets Two; laced Button-Holes:—- Two Gold Epaulettes:—- Gold-laced Hat, White Lining:—- White Waistcoat and Breeches. Admirals. Three Silver Stars on each Epaulette, arid Three Rows of Lace on the Sleeves. distinguished by the Epaulettes and Rows of Lace on the Sleeves, as in the Full Dress. CAPTAINS, Post of Three Years—Full Dress. Blue Coat with Blue Lappels, and long Slash Sleeve, as formerly worn :—The Lappels to have One Row of Gold Lace, and the Cuffs and Pockets Two : — Two plain Gold Epaulettes : —- White Lining :—White Waistcoats and Breeches :—Gold-laced Hat. CAPTAINS, under Three Years.—Full Dress. The same in every Respect as Post Captains of Three Years, but to wear only One Epaulette on the Right Shoulder. The same as Post Captains of Three Years with the Difference only of wearing but One Epaulette as in the Full Dress. The same as Post Captains with a plain Gold Epaulette on the Left Shoulder. The fame as Post Captains, with a plain Gold Epaulette, as in the Full Dress, to take off and put on occasionally. N. B. The Lace to be of the same Pattern as was in Use previously to the Year 1787 ; but that to be worn by Flag Officers to be of greater Breadth than that of the Captains. Officers will be allowed to wear their present Uniform till the 1st of June 1796. Pattern Suits, with the Laces and Buttons, may be seen at the Admiralty-Office. Coat of blue cloth, blue cloth collar, white cloth lappells, and cuffs with five laces round the cuffs; laced as at present. Epaulettes as at present; buttons the same as at present, with the addition, of a crown over the anchor. Blue cloth, blue cloth collar, white lappells and cuffs with five laces; laced round the collar and lappells to the end of the skirts ; flap and frame, hips and back skirts laced; twist button-holes in lappells and flaps as at present ; epaulettes and buttons same as in the dress uniform. The same as the Admiral of the Fleet, with only four laces on the cuffs. The same, with only three laces on the cuffs. The same, with only two laces on the cuffs. The epaulettes, with the respectives distinctions of three, two, and one stars, the same as at present. Buttons as at present, with the addition of a crown over the anchor. The undress or frock uniform of Flag Officers, except the Admiral of the Fleet to be the same as at present, with the alteration only of the button. The Captain to the Admiral of the Fleet, and First Captains to Commanders in Chief (if not Flag Officers), to wear, while so employed, the undress or frock uniform of Rear-Admirals. Captains and Commanders of His Majesty's Fleet to wear uniforms of the same pattern. The full dress to be similar to that now in use, excepting that the lappells and cuffs are in future to he white, laced as at present, with a crown over an anchor on the button. The epaulettes of Captains three years post, to have an addition of a silver crown over a silver anchor. The epaulettes of Captains under three years post, to have the silver anchor without the crown. The epaulettes of Commanders to be plain. Lieutenants of His Majesty's fleet to wear a dress uniform of the same pattern as Captains and Commanders, but without any lace, and with one plain epaulette (similar to that now worn by Captains and Commanders) on the right shoulder; buttons of the same pattern as for Captains. 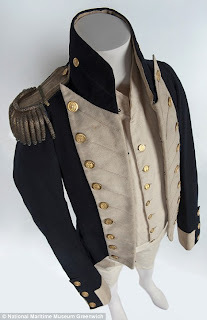 The undress or frock uniform of Captains, Commanders, and Lieutenants, to be the same as at present worn by Captains and Commanders, with the addition of the epaulettes and button, which are to be worn the same as in the full dress. The whole of the Commissioned Officers of His Majesty's Fleet to have the linings of their dressed uniforms, white. The Flag Officers only, to have the linings of their dressed uniforms, white silk. Masters'-Mates and Midshipmen to wear the same uniform as at present, with the alteration of the button only, which is to be of the same pattern as that of the Captains and Lieutenants. Their Lordships do hereby give notice thereof to all Flag Officers, Captains, Commanders, Lieutenants, Masters'-Mates, and Midshipmen, and require and direct them strictly to conform thereto. The said alterations being to take effect generally on the 12th August 1812; but such Officers of the Royal Navy as may have occasion before that period to make up new uniforms, are at liberty to have them made up according to the new patterns. N. B. The several patterns may be seen at this Office.